Posted 04/30/2018 Leave a Comment - Author Shelley Littleton, M.Ed. By Shelley Littleton, M.Ed. and Donni Davis-Perry, M.Ed. T/TAC William & Mary is highlighting a team of co-teacher leaders from Page Middle School in Gloucester County, Virginia. Dana Cooper and Brian Teuke are part of the Excellence in Co-Teaching Initiative, sponsored by the Virginia Department of Education (VDOE). Watch a brief interview that captures Dana and Brian’s reflections on the benefits of co-teaching to gather insight into how they are increasing student outcomes in their inclusive class. 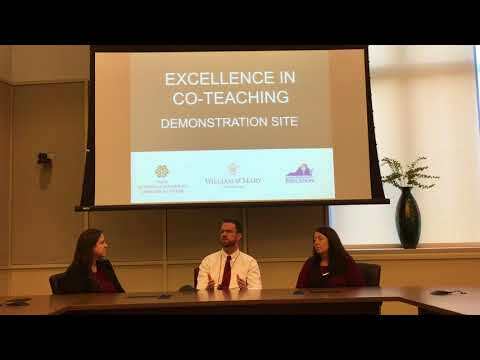 Learn more about visiting an Excellence in Co-Teaching Demonstration site in Superintendent’s Regions 2 and 3, where you can observe co-teaching and co-planning in action. If you are interested in visiting one of these sites, you may apply for a stipend through T/TAC W&M to support your visit. To learn more about utilizing effective co-teaching approaches that allow for the implementation of Specially Designed Instruction (SDI) within the general education classroom, refer to Debbie Grosser’s article The Nuts and Bolts of Co-Teaching.